The Sun Devils fought a hard three-week series of important events; the Midlands Championships, a match at Iowa State, and the Virginia Duals. Photo by Anya Magnuson and Anya Magnuson | The State Press The head coach of ASU's wrestling team, Zeke Jones, welcomes fans to the Maroon and Gold Intersquad Meet at Wells Fargo Arena on Oct. 29, 2016. ASU wrestling showcased strong performances in three crucial mid-season events, earning its best finishes in over a decade. Over the past three weeks, No. 20 ASU wrestling set historic marks at the Midlands Championships in Illinois, at Iowa State and at the Virginia Duals. The Sun Devils appeared composed despite their young and growing roster. Redshirt freshman Zahid Valencia (174) and sophomore Tanner Hall (HWT) shined as ASU finished third at the 54th Annual Ken Kraft Midlands Championship. The Sun Devils outperformed eight teams that were ranked ahead of them, only falling short to No. 3 Iowa and No. 6 Nebraska. Valencia maintained his dominance and unbeaten record by defeating Iowa State redshirt senior Lelund Weatherspoon in the championship match, winning 11-2 by major decision. Valencia was the first individual winner for ASU since 2001. Hall did not disappoint either as he helped the Sun Devils make history by winning the heavyweight division. He and Valencia are now the first pair to win individual titles at Midlands since 1996. Hall leads the entire nation in strength of schedule and is currently ranked fourth in his division. Hall mentioned his continuous improvement and gave credit to head Coach Zeke Jones's advice for his success. At the conclusion of the tournament, the Sun Devils finished in third place; which was their first top-10 finish since 2001, first top-five finish since 1997 and their best placing since 1989 when the team took first place. ASU’s match against Iowa State was the most-anticipated bout of the season given the difficulty the program has had winning at Iowa State historically. However, the Sun Devils carried the momentum they built at the Midlands and came out victorious in Ames, Iowa, for the first time since 1989. The long-awaited square-off of the evening was the rematch between ASU’s Valencia and ISU’s Weatherspoon at 174. They are both top-10 wrestlers in their division, respectfully. “It takes a lot of focus, keeping my head on straight and going out there every match and focusing on my game plan and my task,” Valencia said after defeating Weatherspoon. Valencia started what ended up becoming an impetus push favoring ASU by winning his match 5-2 and defeating rival Weatherspoon for the third time this season. ASU lost its 184 match by major decision, but redshirt sophomore Austyn Harris sealed the team’s fate by escaping his way to victory at 197 with a 3-2 decision win. Hall followed with a victory in a robust heavyweight bout, winning 2-1 by decision. This ASU team was not done pursuing history following its accomplishments at the Midlands and Iowa State, proven by its historic run at the two-day Virginia Duals tournament. The Sun Devils got off to a hot start on day one of the tournament, defeating Bucknell in their first match and fending off a gritty Campbell University team. ASU and Campbell were tied at 20 before the heavyweight bout between ASU’s Hall and Campbell sophomore Jere Heino. It was Hall who played hero for ASU and received the 1-0 decision over the rival and a 23-20 overall win over Campbell. This performance earned them a spot in the championship bracket for the second year in a row. On the final day of the tournament ASU could not seem to keep the momentum going that it built in day one. The team fell short against a talented Oklahoma team in the semi-finals, losing 25-11. Coach Jones said “a balanced effort up and down the lineup,” was missing in their match against Oklahoma. “We needed to protect the bonus points and take care of the small things. We got a couple of close calls that didn’t go our way but regardless of the close calls you still have to get the job done,” Jones said. The Sun Devils got back on their feet to pull off a hard-fought 20-19 victory against North Dakota State to place third overall in the tournament. It was ASU’s first third-place finish since 1997. 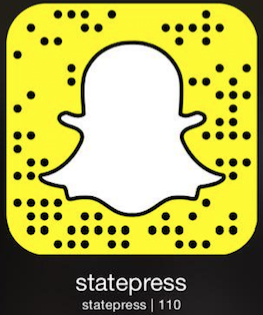 Like State Press Sports on Facebook and follow @statepresssports on Twitter.